Writer Erinna Mettler sparked my interest this week with her post on ‘Desk Envy’. A writer’s desk is such a fundamental part of a their equipment, yet so difficult to perfect, it is no wonder that there are thousands of pictures like the ones of famous writers’ workplaces in her post which can inspire the green-eyed-monster. 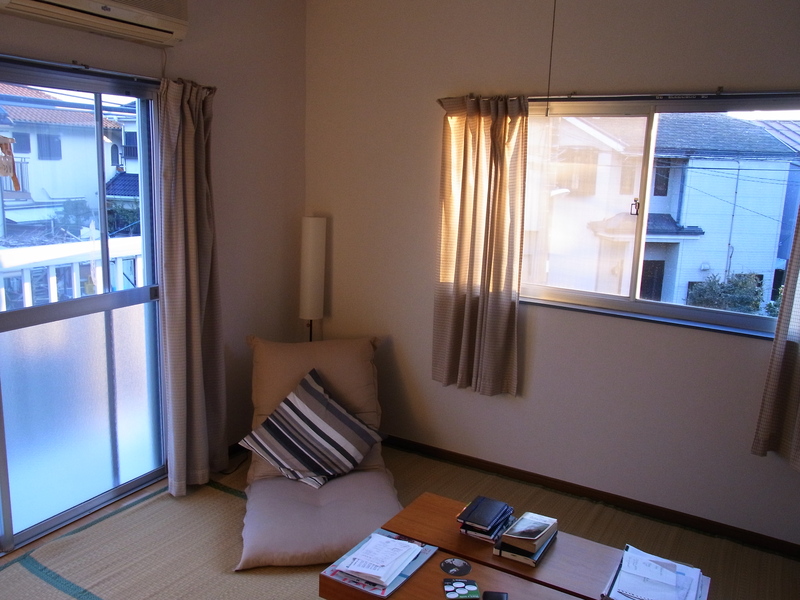 Space in the home is at such a premium – certainly in the UK, even more so in Japan – that for most of us the dream of a quiet room with a huge desk covered with piles of essential writerly clutter and (crucially!) all of one’s own must remain unindulged. Still, we can dream. I was lucky enough to spend some time in the Lake District recently, with hints of spring breaking through the winter gloom all around. The hotel had this lovely number sitting in a corridor seemingly unused and unloved, except by the chambermaids for heaps of fresh linen mid-change. Contemplating all that space for half-scrawled notes and pages torn out of newspapers could give me palpitations. Drawers overloaded with notebooks, both filled and still to be used, cartridges and half-full bottles of ink, because this desk would go so well with my favourite pens… until my thoughts crash into the likely shipping costs to get the thing to Tokyo and realise it isn’t to be. The reality for most of us is that writing space has to exist wherever we find it. When I lived in London I would write sitting on the bed, a cushion behind me and one under the knees, laptop finely balanced, in a pose that would strike dread into the heart of any physiotherapist or yoga teacher. Although it did keep me paying the bills to have my poor spine straightened out again. Having to clear away the detritus which somehow accumulates around any working writer – take the picture of Einstein ‘s desk for evidence – before I could go to sleep was always such a disheartening thought that writing into the early hours became the norm. Of course, it wouldn’t turn out to be the perfect writing desk, otherwise this post would end here. The difficulty, entirely of my own creation, was that there was so much of Japan to explore beyond those walls that I barely spent any time within range of the desk. Writing again became something to do in cafés, on trains, at work, or in the park. Anywhere, it seemed, but at the dedicated space that had so fortuitously been granted. It is summer, hence the mosquito coil kept close to hand, but the air conditioning unit was right above the window and the fridge a short hop away. ten minutes hate became an unneglected website again, letters were penned and the following spring my book, The Teas That Bind, was written here. All punctuated with essential breaks for pots of tea and staring out of the window. The way the butterflies would dance through the sunshine as it dappled between the trees will stay with me forever. The words don’t really flow in public cafés. For a start off I usually bump into someone I know and then there’s the hovering waiting staff asking if I want a refill, or babies crying and if I drink too much coffee it costs a fortune and I keep needing the loo. The café has to be just right, it has to be big enough to hide in from friends and waiters, with tall ceilings and no piped music, and I prefer diverting decoration and real-fire cosiness. It is doubtful if she would be as prolific today, however, if she were attempting to write in the 21st century version of her home-from-home café, surrounded by loudly obnoxious tourists and gawping fan-girls such as myself. Perhaps this is the lesson to learn from all this desk adulation: that the space itself is irrelevant. Make it the best, comfiest, happiest place it can be but don’t get too caught up with perfection. While perfection on the page should always be the goal, sometimes the means and the location of production will have to fall far short of the ideal. Sitting at the dream writer’s desk racked with block and indecision would be a far worse fate than that of being jammed into a tiny table at a terrible café with a mug of bad coffee scrawling note after note on napkins because there is no more space in your notebook. This is great! I wish I could write in cafes. I can just about manage the local pub because it’s big and old fashioned but even here I bump into loads of people. I do like The Booths Museum though – but it pongs of taxidermy! I think the pub would be too much distraction! Maybe this is why foreign cafes are so good, because it’s easier to disregard the chatter going on and less chance of bumping into people. The museum must be very atmospheric too, if a little spooky! Did you write Starlings in one place or here and there? I always imagine you walking around the town with a notebook, it’s so well observed. Yes, around town with a notebook!, Eavesdropping in public places, watching teenagers outside shopping centres! Those were the days. Fun post. I have a hard time finding my desk… Oh! It’s under all that stuff! Exactly as it should be. Always suspicious of people with tidy desks! I was just thinking the same thing 🙂 – lovely desks, but could any of them actually be seen when they were in use or were they, like mine, perpetually under a pile of books and bits of paper ‘about to be tidied/filed’? Never underestimate the power of a great desk. This was such a fantastic article, I was almost sorry it had to end. But when it did, by the author having quoted what was probably the most helpful hint in Stephen King’s non-fiction book “On Writing,” I was completely impressed. I’d been thinking of that exact same quote while reading the entire article. Also, it’s quite validating to know that you’re not the only writer out there who really needs the perfect place in which to create. I’ve had some of my most creatives ideas blossom while walking the dog, taking a shower, and sitting on the steps inside Grand Central Station at rush hour. I’ve had some of my worst sitting at a clean desk with nothing but time and space. When I lived in a small apartment, I would read about all the great innovations created at kitchen tables, in basements, and in garages. That, I felt, was what was lacking. Then I moved into a house with a basement, garage, and kitchen table ……………………….. nothing. I’ll leave you with a wonderful quote from baseball great Yogi Berra, and we’ll take the liberty of substituting the word “writing” for “baseball”: “Writing is 90% mental — the other half is physical.” Enjoyed your post! At first I had tried to make the perfect spot for writing but it has now become my whole bedroom. The board that holds my keyboard keeps falling off and my actual table is full of papers, paperclips, pens, pencils, Dictionary and many more objects. I feel good here, I have a window to look out where I tend to think of words I may have trouble with at the time. I’ve used desks in basements, I’ve written in bedrooms and kitchens, I’ve worked at libraries, at work and even in a synagogue once or twice. The space isn’t absolutely necessary for me, though someday I would like my own space to get into a groove and just write away. Until then, I write, write, write and hope it gets me somewhere. good work! i’m incredibly attached to having a desk. it feels like my own private island of creativity. A simple desk in a clean, well-lighted place is all I need. You’ve inspired me to address my desk yet again – perhaps two months since the last time I did so! The first picture above has me in tears because that’s my dream work desk right there! It’s beautiful, isn’t it? I can imagine happily losing hours arranging all my stuff into the little drawers while I should be writing! Strangely thought provoking! Hadn’t given much consideration to my desk previously, yet I write almost every day. Thanks, Magic! The outdoors is also a great space, I used to have a park bench that I thought of as ‘mine’. Not the best in winter! Wonderful, thank you for sharing this with us. A desk, a desk, my Kingdom for a desk. . . Can’t find mine it’s buried under a load of stuff. Exactly like Einstein’s desk (follow the first link for a picture!) Thanks for commenting, Gerald! I need large, open areas around me: clean vistas ripe with potential, gigantic voids for possibility to fill. I built my huge desk to be a landing strip for ideas. It wraps around two walls of my living room–twelve feet long on one side, eight feet on the other–and samples two picture window’s worth of moving sunlight and burgeoning garden. The corner that it hinges upon houses a floating keyboard stand that allows me to sit or stand while writing and the monitor perches at shoulder level on a few wall shelves above. Nothing mars the pristine shine of all that maple stain around me but the project du jour. My current task is always framed on both sides by giant swaths of open desk space, ready and able to receive tangent projects at the firing of a neuron. I have another room with a similar desk for sewing, the garage repeats the pattern with work tables. The kitchen is redundant with enough clean white Formica to assemble a wedding cake. I love, love, love space. A smooth, flat surface wide enough to sweep both arms across like anthropomorphized wiper blades means the world is big enough for my ideas. At least, it is right here; Starbucks can bite me. Your writing space sounds like paradise. I too, would love lots of space, to hold the many cups of tea and coffee that I drink when I write. Does that mean you write on pen and paper? I’m relatively young and I’ve grown up on the computer…but I sometimes still write in a notebook. Sometimes my English teacher also asks us to write without technology when we free write in class. 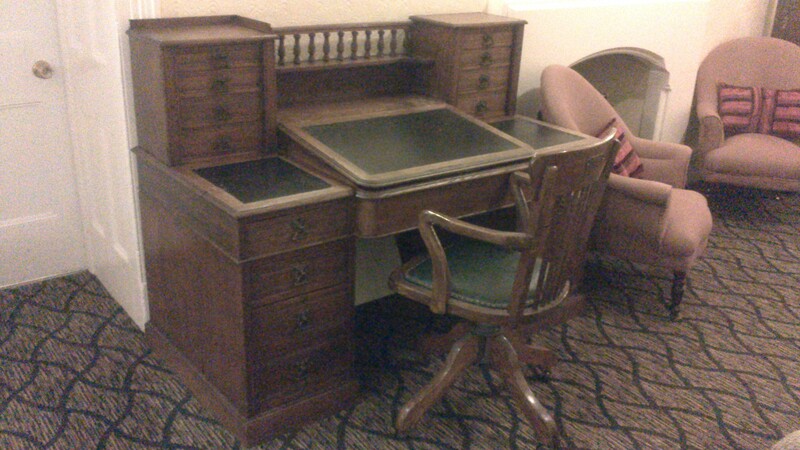 I once lusted after Charles Dickens’ desk, but right you are, ‘writing space has to exist wherever we find it’. There’s never a perfect spot, just a writing state of mind. PS. 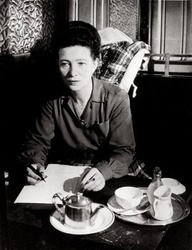 Even sitting at my local cafe (how nice it must have been to do it in Paris) and pretending I was Simone de Beauvoir didn’t hellp me write like her, just write like me. All the same, it felt good.. Good post. A Desk of One’s Own is as important as a Room of One’s Own, I think…. A really enjoyable and thought-provoking piece. Where we write, and where we think, is very personal to each of us. I get inspiration from the world around me and from the Internet in front of me. But when it comes to turning thoughts to prose, I need a quiet room, access to my books, and space to pace. I often wonder: is any desk better than no desk at all? I’ve spent the last two hours, sat on my living room sofa, laptop toasting my legs, whilst I work on the draft of my next blog post. There is a void behind me crying out for a desk where I can rest my laptop, lay out my notes, do my research. But I can’t find a desk that fits. I need the Goldilocks desk: not too big, not too small, not too cheap, but won’t break the bank… I’m willing to compromise, but I won’t have just any desk. Loved your post, but I’m skeptical of the quote at the bottom; I think that art is the reason that humans exist in the form we do, and that’s not to say art is just visual or musical or theatrical or whatever. Everything is an art, from being a housewife to a business man. So I think that we build a fantasy around art to allow us to continue to create it. Thanks for commenting, Gil! It’s a good point, I think you agree with Stephen King though, in a way, that art shouldn’t be this special thing we need a sacred space for – it should be everyday. And if that means tapping notes into an unsent text on your phone on the commute to work, so be it. I used to think that I needed so much in order to write–from certain books surrounding me, a particular kind of perfect desk, serene and beautiful scenery outside. Now? My whole philosophy on this has changed. These days, I write best at night when my house is most silent. I look at a cream colored wall with a few postcards and some sentimental things pinned to a framed corkboard above me, and my desk is relatively clean. As long as I have my laptop, a mug of hot herbal tea beside, and sometimes the Sarah McLachlan Pandora station playing to keep me going, if I just sit my tush down on the unbelievable uncomfortable wooden chair and just start writing then that’s all that matters and I get the job done. I’ve spent way too many dollars and precious time in cafes and coffee houses distracted and getting nothing done. I’d rather write at home, staring at that blank wall. I loved this post, too. Your writing is enchanting! My writing space is sadly the kitchen table, but i am usually up at 5am to write so its my space and it has a million dollar view of Mumbula Mountain, my peaceful place to write. I love cafe’s for crowd watching descriptions etc. BUt I need total silence for writing…love your post. Despite your desk dilemma, it appears you’ve achieved the goal: writing worth being read for entertainment as well as education. Beautiful piece. Functional too! Though I felt a tad guilty as living in the land of excess affords me space for a desk crammed with those pens and notebooks and writerly objects of which you only dream. In truth, less often is more! This post was amazing. I find myself often in The situations you mentioned, waiting for The perfect spot, or moment, or mood and The like. Your writing took me through japan, paris and The cafe’s you mentioned even as i read your blog on my 3.5 inch screen gprs phone. . . keep writing. I join your feelings on this subject. Desks can be intimidating too, I write all over the house, I write when the urge comes over me and I can’t get it out fast enough! Sometimes I wake up and tippytap in bed! I am nearly incapable of sitting at a desk by choice. Most of my writing goes on with a lap desk while sitting in bed or on the couch. I can write at the coffee shop, as long as I don’t start daydreaming. I don’t usually run into people I know, and the atmosphere is perfect, because most everyone else is busy working on their own projects, whether they’re editing photos, doing homework, or working from the coffee shop instead of the office. Sadly, my own desk has been dominated by my fiance. I stole all of the closet space and he has laid claim to the desk. It’s alright though, I travel into the city for my coffee/writing fix. “The reality for most of us is that writing space has to exist wherever we find it.” You said it! This is so true! Personally, I believe that a desk is something an individual long for. Even if he is not a writer. It always important to remember that aside from the efficiency brought by working at a desk, it is also a way of taking care of yourself. If only your body can curse, it began to do so as soon as you work with improper posture. Great post! Thanks for this post, what a cute topic to write about! I dream of having my very own “writing room” one day, complete with a big, sturdy desk and a gorgeous library behind me to house all the books I would love to keep! But sadly, my current room is too small to have a table! So, I write at the family dining table for now! And for all those who said they can write in cafes, I really admire you guys! I would LOVE to write in a cafe but I get too distracted people watching! enjoyed your post – i love writing at cafes…love spending my time there with my laptop and a cup of coffee though honestly, i do not have any dedicated space or furniture for it. I’ve had some of my most creative thoughts while walking to work or while at a shower, perhaps even in the middle of the night, in between sleep and waking up – and you mentioned, it is the writing which should be focussed upon and not the surrounding though a little comfort never hurt anyone. interesting read. congratulations on being fp! Reblogged this on Gambat Youth Forum. Indoors, outdoors, it doesn’t really matter where, as long as I can gather my thoughts and focus on what I’m doing. The floor, a table, a cushion, a train seat, under a tree… go where the writing takes you! Ideas float everywhere. The writer’s job is to catch a glimpse and elaborate the thought. I have a few desks and tables where I write. Loved the post. A great post! 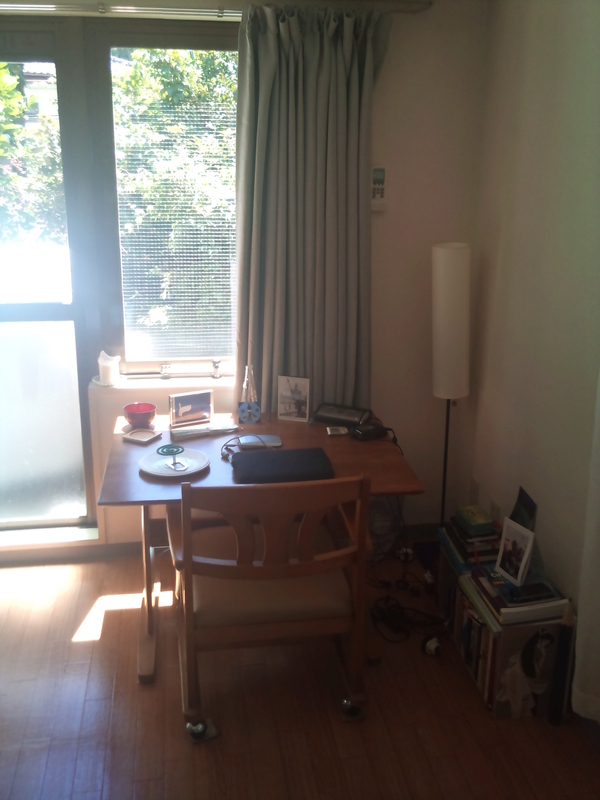 I had recently written about favorite writing spaces in my blog. As you say, it boils down to this: “Perhaps this is the lesson to learn from all this desk adulation: that the space itself is irrelevant.” When you need to write, you will make do, even if the space you’re in is not ideal. I can definitely relate to this difficulty. I have a desk but the top is too cluttered to work at any more and underneath it are plastic crates full of shoes (my big weakness) so now it is actually impossible to pull a chair in and fit your legs underneath. So basically my deck has become a glorified shelf. Can’t overstate how much I empathise with this. My desk isn’t all that aesthetically pleasing, but it’s mine, and I have it as I want it; it’s my ideal environment for expression and creativity. Since I’ve had my workplace sorted, and started writing a LOT – I’ve even been healthier. I think I’m a little in love with my desk. I’m the same way – my creation space is SO important, and sometimes my desk is covered in bits, and sometimes it’s clean, but having the space is crucial. My boyfriend thinks I’m insane to “waste” space on a specific place for writing…he’s not one of us, lol. Leila and Warren, thanks for reading and commenting! Think it has to be a place you’re happy to spend a lot of time in – it’s only natural for writers to obsess over desks as you’ll invariably end up staring at it for ages thinking – but believing that you won’t be able to write unless it’s perfect is the enemy of just blooming well getting on with it. Loved your post! I’ve always thought of a dream desk/writing space and also wondered if I’d write amazingly better in a space like that. But then, what I’ve noticed, most often, is I tend to write a lot more in a crowded, noisy restaurant/cafe….probably because so many thoughts cross my mind and I want to jot it down before it gets lost in the noise around. 🙂 Great post. Congratulations on being Freshly Pressed! Fantastic! I fully enjoyed that read! Especially the quote by Stephen King. Nicely done. Jane Austen wrote all of her novels at a small sitting table in between visitors and daily tasks. If she can write some of the greatest novels there, we should be able to write anywhere. Right now, my desk varies between the commuting bus and my couch. The only two essentials for writing are 1. the imagination and 2. something to record what our imagination wroughts. I thoroughly enjoyed your article, and I even read every comment too! A little unusual for me as I often get bored, but I am fascinated by everyone’s take on the perfect writing conditions and for what helps the creative process. For Years for me it had to be the right pen or notebook, then a P.C. although I could hardly indulge in the purchase of technology with five mouths to feed. As my family of girls grew and the house became a whirlwind of Henrietta Hormones, My husband indulged me and built a little summerhouse at the bottom of our garden for me to escape to write, as the chicks flew the nest and the summer house became too cold, I transformed the back bedroom overlooking my beloved garden into my creative studio/office. I had an old school teacher’s desk that had been painted blue! I stripped it, sanded it down varnished and painted it and I love it! I am new to wordpress this is my second day and after reading all of the above comments I feel really quite spoilt to have two great writing desks, and I love this online community of writers, I no longer feel isolated indulging my passion, I hope you all follow me too and give as good feedback! Keep writing everyone wherever it suits you! The Stephen King quote at the end sealed this post for me–I recently read his “On Writing,” and copied that quotation into my notebooks. I also love the theme of this post–I’m currently either a kitchen-table writer or a chair-on-the-balcony one, depending on the weather. I have no desk, but I love the idea of a desk. I have a corner, and that is where most of my writing happens. It’s interesting to hear your perspective on an actual desk, though, and how it can affect writing. I used to have a desk, but I don’t think it did anything in the way of assisting or resisting my writing attempts. Great job conveying that feeling about writing, and utilizing a desk, even in Japan. I definitely don’t have a desk because I have so many dressers because I have so many clothes…but now I want! I was just thinking about how I needed to buy a second super light laptop to be one of those coffee guzzling peeps in a coffee house, but a chic little desk would be MUCH more fun to buy! 😉 Great post, congrats on FP! I can never seem to find my desk through the clutter! I know when I do have it uncovered sometimes that I can get quite a bit accomplished. What is usually your inspiration? This is a great piece … I would love to have the time to write properly.. I do dream a little of being able to put my pride and joy bureau to true use..even have a document squirreled away with more than a dozen stories waiting to be expanded and turned into full books.. ranging from children’s stories to dark tales… Do you have a hidden passion or even a hidden desk fetish? Can you tell me which hotel it is? I’m sure they won’t part with it, but I’m prepared to give it a go. What a beautifully written post – a pleasure to read. Enjoyed your post a lot, thank you. Wonderful blog! I find my best places to write I when I’m on the bike at the gym or when I wake up in the nights . A lot of times I will think a funny though, jot it down as a title and then things spiral from there no matter where I am. I guess I’m good at putting my brain where I want it to be. Bravo on the blog again! Thank you Vincent! Completely agree with you about walking around or losing yourself in something else. My own favourite was a couple of years ago when I had a 30 minute walk to work – music on loud, ignoring surroundings, scribbling in notebooks as I went (hardback ones a must!) It was bliss. Sometimes the brain needs distracting from what you want it to do. This sounds perfect, Stina, I wish you many happy hours of creating there. Thanks for commenting! Exactly right. The synagogue sounds like it would be atmospheric. I hope it gets you to the right place, I’m sure it will. Sounds perfect, thnks for commenting, TIm. Thanks for reading! Where do you like to write, if not at a desk? I’m trying to reply to allthoughtswork’s comment but I can’t because I’m consumed with desk envy. It sounds so good! Thanks, Mary, I think you’re right – it’s all in the mind. Paris cafes are lovely, if a bit noisy! Thanks for reading. Loved the article, although I dont have the writing desk, my work desk is equally messy. Loved ‘The Teas That Bind’, I read it over a week on the way home to Formby (half an hour’s solid reading), and felt like you were sitting next to me having a chat. Made some mental notes of brilliant comments, will pass on again.